Mayor Rahm Emanuel and World Business Chicago announced that the 2018 Chicago Venture Summit will be held October 2 – 3, 2018, with events held at Google’s Chicago headquarters and innovation hubs throughout the city. 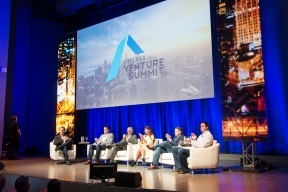 Organized by ChicagoNEXT, World Business Chicago’s council of technology leaders, the fourth Chicago Venture Summit offers firms one-on-one access to entrepreneurs, investors and leaders of Fortune 500 firms. The invitation-only event provides two full days of industry-specific networking and programming featuring Chicago’s leading innovation hubs; pitch sessions and panels from Chicago-based entrepreneurs and startups; insights from local and national venture investors; and forums highlighting Chicago’s global leadership in talent development, its leading industries, and its focus on innovation. The 2018 Chicago Venture Summit also builds on the growing momentum of the local technology ecosystem in 2017. Technology companies in Chicago raised $1.73 billion in 2017, with rounds from 188 companies representing one of the city’s best-ever years to date for venture funding, according to a recent report from Built in Chicago. A total of 34 companies raised $10 million or more, and 43 companies had exits over the past year. Google, JP Morgan and William Blair return as lead sponsors for the 2018 Chicago Venture Summit. For more information, visit chicagoventuresummit.com.